I know there is often disagreement about what a "demotool" is, but it is the closest category I could find (you use it to make demos, so to me that is a demotool). I also added the Amiga OCS/ECS and Amiga AGA platforms as well as windows, so that people looking for Amiga tools can find it. Even though it strictly doesn't execute on Amiga, I felt it was appropriate. Enjoy, and please post all your comments/criticisms/bugs here. Thanks for this! Can't wait to try it. This is awesome. Demotool or not, it's a huge service to the community. I really needed such a toolchain. Thanks a lot! Cool. Might make me interested in amiga coding. but providing this is worth a thumb anyway. rulez added on the 2012-02-16 18:38:45 by ɧ4ɾɗվ. Maybe this will help compiling my 1992 Amiga code again as compo filler for Revision :-) Thanks! rulez added on the 2012-02-17 01:33:08 by JAC! the supplied WinUAE doesnt run, sais something about missing kickstart roms. Dito. Will probably never have a use for this, but it's good to have this here. I ACCIDENTLY IN MY PANT! just fiddled around with it a bit. another thumb up! I decided to try this toolchain for my first Amiga prod. 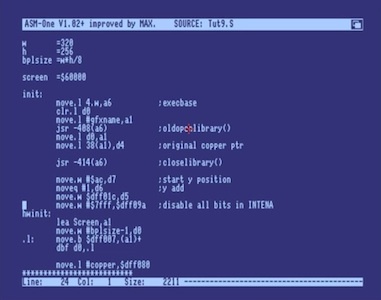 It works great out of the box if you plan on mostly doing 68k assembly, but one thing it doesn't support is calling AmigaOS functions from C code. I've patched the toolchain to allow the AROS headers to be properly included from C, and not generate compiler errors with the included VBCC compiler. I've put all of the modified headers up on github, along with descriptions of what I changed in detail. Please feel free to include these modified headers in a new toolchain release! Fixed link to my modified headers on github. page created in 0.017361 seconds with 15 queries.